Regular readers will know that I have a soft spot for La Colombe, the Philadelphia-based coffee shop/roaster chain with branches in various east coast cities, California and Chicago, where I visited the Wicker Park branch on my round-the-world trip in 2016. Today’s Coffee Spot, the Gold Coast branch, is Chicago’s fifth La Colombe, having opened in February 2018. It’s a small spot, with just enough room for the counter (which has a few bar stools at the back) and a row of four tables along the window at the front, plus, in the summer, a bench out front. 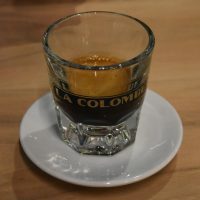 The lack of size doesn’t stop it from offering pretty much the full La Colombe range though, with two options on espresso, another two on batch-brew and three on pour-over through the Silverton dripper. There’s also a range of in-house teas and draft lattes and, if you’re hungry, cakes and prepared salads.